A canary yellow–floored bathroom with corrugated plastic walls is the centerpiece of the renovation. A small greenhouse with a drip irrigation system is place between the two most humid areas in the apartment: the bath and a smaller, more private shower room. It's the only room without underfloor heating in the entire apartment to ensure that the plants don't dry out. A cutout oculus in the living room offers a peek into the plant-filled bath, while a curtain can be drawn to control airflow. At just under 1,400 square feet, the three-bedroom apartment benefits from built-in space savers including sawtooth shelving and even a fold-out bench. The bathroom is located at the heart of the apartment, with sliding plastic doors of varying transparency that can be moved into a number of configurations. What was once a dark apartment is now a bright home filled with candy colors. With her grown sons about to leave home, a Spanish woman decided to move from the suburbs to central Madrid. The change of scenery would mean downsizing, so she called upon Husos Architects to renovate a circa-1900 apartment into a sanctuary she can enjoy alone time and entertaining equally. The main requests she presented to the architects included a large bathroom where she can enjoy soaking in the tub, room for her many plants, and a place to entertain visitors. 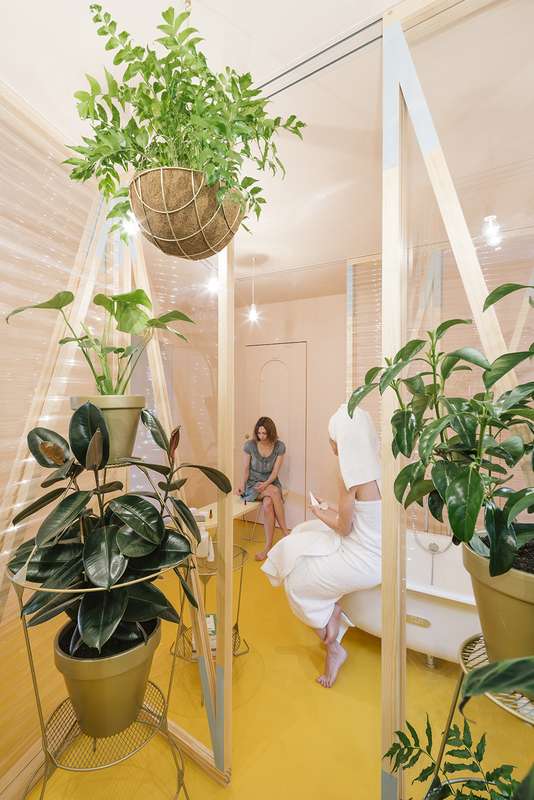 Architects Diego Barajas and Camilo García came up with a solution that accommodated her wishes in a bold way: The Bathyard, a concept that places a daring bathroom at the center of a minimalist yet cheeky design that can be adapted to the resident's needs at any moment, while considering both the apartment's social and bioclimatic functions. The apartment was reworked to increase air circulation to keep temperatures comfortable and to bring more natural light into the space, with the goal of keeping architectural interventions to a minimum. A hole left from an existing cabinet was turned into an oculus, and simple plywood structures were built-in for shelving and other architectural details. The centerpiece of the project is the combined bathroom-greenhouse, a transformable place that can serve as a social hub or private, plant-filled oasis.